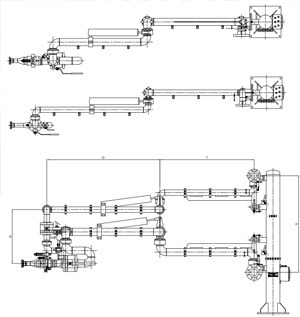 OPW manufacture a comprehensive range of Top and Bottom loading arms for liquefied gases which are designed to offer maximum flexibility and safety during loading and offloading operations. Typical applications we have worked with are the transfer of LPG, Gas condensate and similar media into Railcars or Tank trucks, with connections made at the rear, side or top. A set generally consists of a 3”/dn80 product arm and 2”/dn50 vapour arm or for higher throughputs, a 4”/dn100 product arm with 3”/dn80 vapour arm, typically mounted on a common stand post. Associated components include a shut-off or loading valve, purge-or relief line & safety break away coupler as well as position indication and parking lock. Coupling systems can be offered to accommodate any customer standard and all OPW LPG sets the unit can be folded together for convenient, compact storage away from the traffic flow. We appreciate that few applications are ‘standard’ so as with all OPW equipment, we can accommodate a variety of custom applications.